The ANALIA was built in the 1920s by the prestigious British shipyards of the BERTHON BOAT COMPANY according to the project and specifications of Scottish ALFRED MYLNE (1872 – 1951). The Berthon Boat Company is one of the oldest shipyards still in active that, since its foundation over 200 years ago, remains the property of the same family of navigation lovers, the Mays. Launched in England (Lymington) in 1925 with the original name of MAIRIE, it received the Maltese Cross of the LLOYD’S REGISTER -one of the highest-rated awards within this authority- thanks to the quality and high standards of its design, materials and constuction process. In 1930, the boat is acquired by its first Spanish owner, Mr. Miguel Sans Mora, this time under the name of VANESSA. Mr. Sans Mora was an unforgettable figure, and one of the main driving forces behind Spain and Europe’s competitive navigation. A man that, for more than 20 years, carried out the role of Commodore at the Real Nautical Club of Barcelona and President of the International Committee of the Mediterranean with enthusiasm and skill. In that same year, Mr. Sans moves the boat to Spain and, following the family tradition, renames it to CONCHA II (his mother’s name), and competes in many races with excellent results. It is worth highlighting the first competition organized in Barcelona after the Civil War, which covered the route between Barcelona and Palma. The different scale models and paintings that decorate some of the Club’s quarters are a great memory of that era and the importance of the ANALIA. It is worth noting a magnificient painting by Jose Maria Prim, where the boat is depicted with its original tackle and the sails perfectly positioned, demonstrating the skill of an artist well-versed in the art of sailing. In 1947, Mr. Sans sells the boat to D. Ramón Beamonte del Río, and replaces it for the equally emblematic ALTAIR. Mr. Beamonte del Rio moves it to the Balearic Islands and subjects it to an intense restoration process that included the replacement of the original tackle with the spanker sail for the actual Marconi. In the 50, the boat has many different owners and undergoes several name changes (LHASA, ADASTRA, POLYNOME, …) until the beggining of the 60s when it’s acquired by the Count of Estradas, who changes its name to ANALIA (legend says that it was name in honour of the Spanish-Argentine actress, Analía Gadé, pretty famous in those days and a close friend of the Estradas family). In the 70s, the boat returns to Catalonia along with Mr. Mariano Martí-Ventosa, who docks it in Aiguadolçe until the mid 90s when it’s acquired by Mr. Boissier, a french shipowner who crosses the Atlantic Ocean with it in 1998. Right after, he moves it to Cannes, and it becomes, once again a regular of the Mediterranean regattas for classic boats. In 2010 it’s acquired by the actual shipowner, who docks it once again in the Real Nautic Club of Barcelona. At the same time, the boat undergoes a new and careful restoration developed in several stages under the technical guidance of the prestigious naval office BARRACUDA YATCH DESIGN. During this process, a teckwood deck identical to the original which remains as a base is built, preserving all the original elements and features while still maintaining the Marconi tackle. Both the framework, the hull and the ANALIA’s deck are built entirely in teakwood, whereas the furnishings and the interior marquetry elements are made of mahogany and teakwood, with iroko wood payoles. A true eye-catcher is the completely original, English-styled living room, with its decorative and functional original details such as pulleys, bathroom fittings and bathrooms. Also worth highlighting is the shell-shaped chart room, made in casted wood -a period innovation that confers a particular and unmistakeable sign of identity. 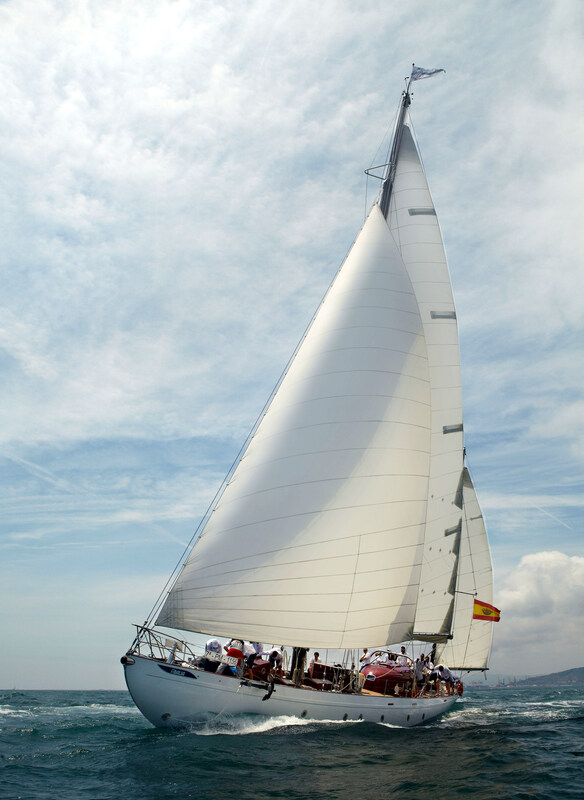 The ANALIA is currently part of the craft fleet that make up the PATRULLA AUXILIAR MARÍTIMA of the REAL LIGA NAVAL ESPAÑOLA. REAL CLUB NAUTICO DE BARCELONA – A.E.B.E.C.